The men’s team and individual title race really kept the fans guessing throughout (in fact, I don’t wait to spoil anything by having pictures of the winners at the top of the article, just to keep you guessing). Part of it was due to the slow initial pace the field was running (6:18.2 at 2.1 km, 13:07.7 for 4.1 km). Another part was just all of the strategy that was taking place, as not only were the leaders changing all around at each check point, but so were the remaining scorers. The field came through the 5 km checkpoint in 15:48.9 – led by Columbia sophomore Kenny Vasbinder – but the team score was surprising. Princeton and Columbia were tied at 42 points apiece. Princeton had four athletes in the top 10 – Conor Lundy, Garrett O’Toole, Noah Kauppila, and Robert Stone – to Columbia’s three – Vasbinder, Ryan Thomas, and Brian Zabilski. Then the race really got exciting. Lundy and Thomas got to the front of the pack by the 7.1 km checkpoint – both timed at 22:36.8 – while Thomas had support from Vasbinder and Zabilski just steps behind, while Kauppila was two seconds back of the leaders. The team scores at this point only had Columbia by 1 point over Princeton. Thomas was the 2017 Outdoor Hep 5,000m champion, and using a final sprint, he managed to get away from Lundy and the rest of the field to claim his first cross country title. Thomas won in 24:57.0, a perk for the Lions on their home course. But Princeton’s roster is filled with many strong middle distance runners, and with the final stretch behind flat, straight, gravel path, these athletes used their kicks to pass by field and get all five of their scorers into the top 10 (seven runners in top 20), led by Kauppila in second place, Lundy third, and O’Toole fourth. 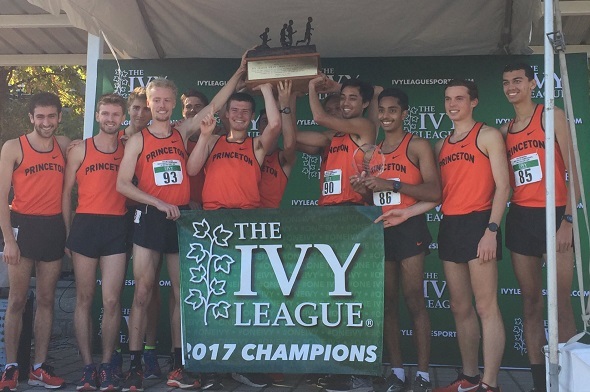 With Princeton’s scoring spread of 20 seconds, they claimed the team title in 28 points. 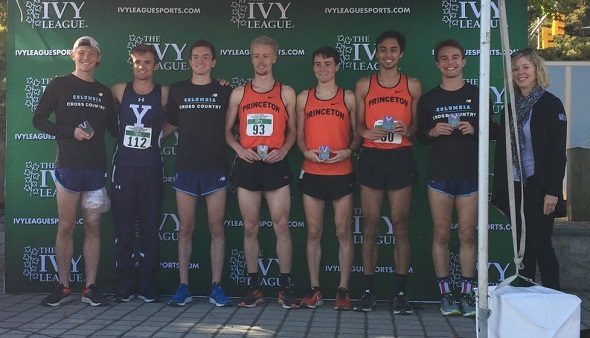 Columbia ultimately finished in second place with 43 points, as Thomas was joined by Vasbinder (fifth) and Zabilski (seventh) for First-Team All-Ivy Honors. Trevor Teinhart of Yale was the first non-Columbia/Princeton athlete to cross the line, as he was 6th in 25:08.6. This entry was posted on Friday, October 27th, 2017 at 12:01 pm. It is filed under Featured, Heps Champs, Spotlight. You can follow any responses to this entry through the RSS 2.0 feed.